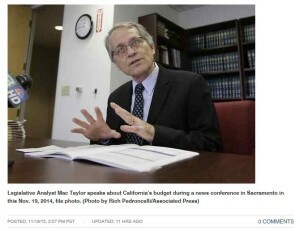 The Legislature’s nonpartisan fiscal analyst projected Wednesday that California will enjoy a series of multibillion-dollar budget surpluses for the next few years. It is now obvious that Brown could have budgeted the $350 million that would have represented a 10 percent boost to funding for California’s most vulnerable and voiceless population, those with developmental disabilities. That’s what the Lanterman Coalition, an umbrella group representing agencies that work with that population, sought in the 2015-16 budget, along with a stable method of funding developmental services in the future. This editorial board has supported the coalition’s call all along. Brown neglected the developmental community throughout his budget process the first half of this year. Then, when the Legislature presented him with an all too modest developmental funding hike in June, he zeroed it out and legislative leaders quickly caved. Now Legislative Analyst Mac Taylor projects that 2015-16 revenue will be $3.5 billion higher than the budget shows under Brown’s very conservative assumptions. That’s plenty of “extra” revenue to give developmental services that 10 percent funding bump. And that’s just what Senate Bill X2-4, by Republican Sens. Jim Nielson and Jeff Stone, would have been doing by now had it passed. But the bill was never even brought forward for debate in the legislative special session on health care and developmental services. It would have dedicated “excess” revenue to developmental funding, retroactive to July 1, 2015. “With a strong revenue projection, we must address the inadequate funding for those individuals with developmental disabilities,” Nielson said in a statement issued after the LAO report. There’s agreement on both sides of the aisle in the Legislature that proper funding of developmental services is a priority. Why can’t this get done?